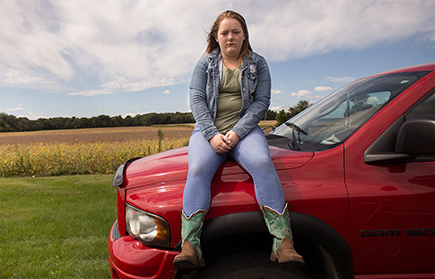 “Girl,” by Christine Heller of Lakemoor, is part of an MCC student group exhibition, “Portrait Mode” at MCC’s Satellite Gallery in the Old Courthouse Arts Center in Woodstock through March 10. At right, "Collar," by Kathryn Beam of Crystal Lake is part of the MCC exhibit. An opening reception takes place from 5-7 p.m. Feb 7. 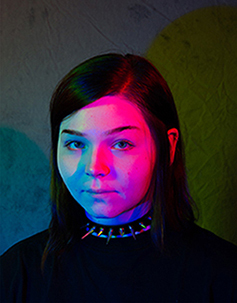 The McHenry County College (MCC) art exhibition, “Portrait Mode,” features the work of current MCC photography students at the MCC Satellite Gallery, located in the Old Courthouse Arts Center, 101 N. Johnson Street Woodstock, from Feb. 7 through March 10, 2019. An opening reception takes place from 5-7 p.m. on Feb. 7. Named after the Automatic Function on most cameras and phones, “Portrait Mode” presents new images by student artists who re-imagine strategies for creating portraits, which is anything but an automatic response to their subject matter. The work in this exhibit examines these students’ varied interest in using the idea or format of a portrait to create meaningful photographs. Student artists include Kathryn Beam, Megan Gurba, Matthew Bork, and Wyatt Prather, all of Crystal Lake; Janet Gaffney of Harvard, Roni Durbin and Michele Janelli, both of Huntley; Christine Heller of Lakemoor; Yuecheng Zhang of Palatine; and Jenna Ahrens of Prairie Grove. This show is part of an ongoing series in the Satellite Gallery at the Old Woodstock Courthouse, in partnership with The Northwest Area Arts Council. The exhibition and opening reception are free and open to the public. For more information about the exhibit, contact Justin Schmitz, MCC photography instructor, at jschmitz@mchenry.edu. For more information about the MCC Art Department offerings, contact Matt Irie, MCC art department chairperson, at (815) 455-8552 or send him an email at: mirie@mchenry.edu.